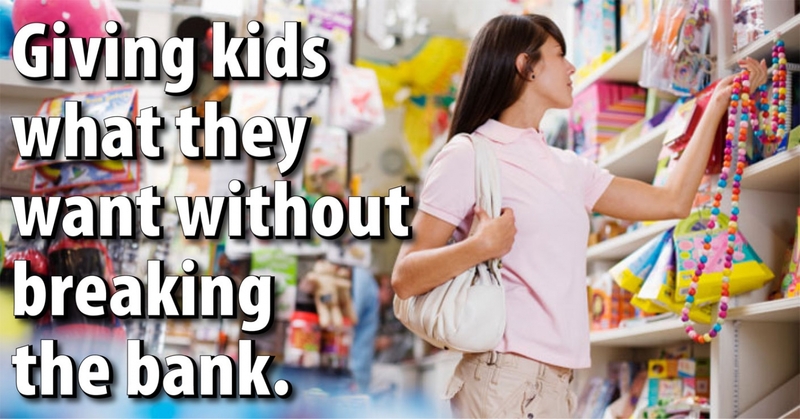 Giving kids what they want without breaking the bank. As children write their holiday gift lists, parents face the pressures of balancing a trim shopping budget with pleasing their kin. Read on for strategies for granting your little one’s wishes without tipping the scale. Take a good look at your child’s list. Do not be tempted to buy everything listed. Set a budgetary amount, either per child or item, that you can reasonably spend. Consider asking relatives to chip in for expensive gift items. Remember that toys are phases in your children’s lives. If you cannot afford the latest “it” toy or gadget, don’t sweat it! Implement a savings plan for yourself within your set budget. Plan out how much money you expect to earn in the months ahead and the amount needed for necessary and fixed bills. This helps you determine what extra funds remain for gift spending. Instead of relying on credit cards for gift purchases, which typically have exorbitant interest rates, achieve a reasonable holiday budget based on a percentage of cash already available within your bank account. This helps to ensure you can afford purchases and prevents risk of overspending. Monitor coupons and store sales to help stretch the value of your dollar. If the item your little one wants goes on sale prior to the holidays, seize the moment and purchase it early. If you can’t get their no. 1 choice, think outside the box. Surprise them with smaller and less expensive gifts they might not be expecting. Bring your list with you whenever shopping to avoid distraction. Once you are through with your buying mission, stay out of the stores to avoid impulse buying. If you are not confident that you have the willpower to beat temptation, send in a significant other or friend to buy the item. Some retailers allow you to use this option for the holiday season. Layaway can help hedge against holiday debt. Since items can be saved for and paid off in smaller increments each month without interest, you can spread your shopping out over a longer period of time and pay it off without accruing any additional costs. Browse the Internet and sales brochures. Look to compare available deals. Shop at stores you have store club cards to cash in on any reward coupons. Use left over gift cards to help pay for presents. If you decide to purchase a gift card for anyone on your list, stick to cards that don’t tack on additional fees. Keep track of how much you have left to spend. If you have reached your maximum budget, do not overextend yourself with purchases you cannot afford. Be accountable for every purchase made and every dollar spent to ensure you stay within your limit. Go with the grab bag option. This helps to keep costs down when buying presents for cousins, nieces and nephews. Talk with family members early on to explore interest and set a spending limit for each participant. The holiday season is stressful enough without the financial pressures of feeling like you have to get your children everything they want. Children can learn a good lesson in realizing that they cannot have everything they want and that choices have to be made. While your holiday wish might be to grant all your children’s wishes, do not feel guilty. Take comfort in knowing that you are helping to ensure that your children become financially conscious and responsible. Remember, it is not the monetary value but rather the thought that counts. About the author Leslie H. Tayne, Esq. Leslie H. Tayne, Esq., is founder and managing director of The Law Offices of Leslie H. Tayne P.C., a law firm dedicated to debt management, debt resolution and bankruptcy avoidance that is based in Melville, White Plains and Mount Kisco, New York. Tayne regularly provides insight and strategies regarding all areas of debt, including business, credit, mortgages and student loans. She can be reached at admin@attorney-newyork.com.